Even though it is now March, there is still one last chance of a snowstorm. To compensate, salt is sprinkled onto the roads. 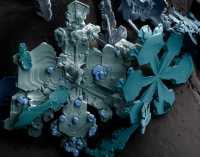 While salt and snow appear to be adversaries in this scenario, they also have similarities – the characteristic this post will focus on today will be that snow and salt are both crystals. Crystals are a highly organized solids often characterized by their geometric shapes with flat faces intersecting at specific orientations. These geometries are dictated by the arrangements of the crystal’s molecules into a regular, repeated structure known as a lattice. The lattice can have different geometries depending on the molecule within the crystal, in addition to the type of bond that forms the crystal. Here, we focus on three types of bonds : covalent, ionic, and hydrogen. Covalent bonds are formed between atoms when they share electrons. 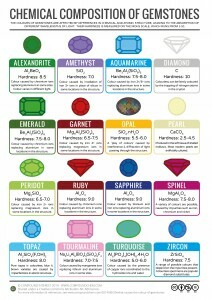 Gemstones, arguably the most iconic crystals, are formed with covalent bonds. 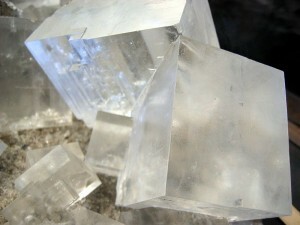 Quartz, a common crystal is shown in the image to the right, has a chemical composition of SiO2. Each silicon atom (Si), represented as a blue circle in the schematic, shares its electrons with two oxygen (O) atoms, represented as red circles. These shared electrons, or covalent bonds, are represented as black lines linking the atoms. Although pure silicon dioxide quartz is optically clear, quartz can come in different colors: purple (amethyst), orange (citrine), pink (rose quartz), grey (smoky quartz) and many more. Colors are created by impurities trapped within the crystals for the above quartz varieties by elemental iron, oxidized iron, phosphate, and additional silicon, respectively. Similarly, some other gemstones also have the same composition but vary in color because of the impurities trapped in the crystal. Most notably rubies and sapphires have the same chemical composition, but chromium impurities give rubies their distinct red color. 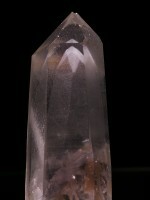 Other gemstones such as topaz, zircons, and garnets can also vary in color. While gemstones come in many different colors and compositions, they share the characteristics of being crystals made by covalent bonds. A second way to form crystals is through ionic bonding. Ionic bonds are formed when ions with positive charges (cations) are in close proximity to ions with negative charges (anions). Every ionic crystal is composed of at least one cation and one anion creating a net neutral compound. Table salt is made out of sodium (white circles) and chloride (green circles) ions. Sodium has a positive charge while chloride has a negative charge. Since oppositely charged ions attract, cations and anions will alternate and create a very regular pattern. Therefore, the lattice in ionic crystals are held together with the electrostatic force of ionic bonds. When water freezes, it too becomes a crystal through a process called hydrogen bonds. Similar to ionic bonding, in hydrogen bonding the molecules forming the crystal does not share electrons. 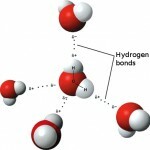 Hydrogen bonding occurs in molecules that have a hydrogen covalently bonded to an atom that is eletronegative, meaning the atom holds onto its electrons very tightly. Therefore, the electron will spend more time around the eletronegative atom rather than the hydrogen atom. 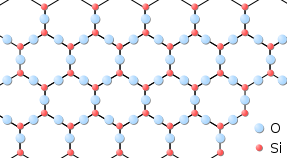 In water, two hydrogen atoms are covalently bonded with an electronegative oxygen atom. Therefore, the water molecule will be slightly negatively charged around the oxygen atom and slightly positive around the hydrogen atoms. Further, these slightly charged portions of the molecules will align to create a lattice. In addition to hydrogen, other atoms can create bonds that help align molecules as well. Scientists use this phenomenon in a technique called x-ray crystallography. In x-ray crystallography the structures of molecules can be determined. First, a specific molecule must be purified and allowed to aggregate into a crystal. Next, a series of x ray beams pierce the crystal. Some of these xrays will be deflected by molecules creating diffraction patterns. 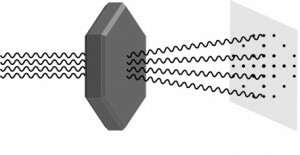 Because specific structures will create specific angles and intensities diffraction patterns, scientists can piece together the structure of the unknown molecule. By using a crystal of the molecule, scientists can benefit from the organized lattice structure. From jewelry to the weather and even our kitchen tables, crystals are adding not only a bit of beauty, but also a bit of structure to our lives.